Eleven years ago, on a visit to Mexico, Sascha Berolsky fell in love with Mexican cuisine. On his return to his native South Africa, he convinced three other partners that the time was ripe to open a Mexican restaurant. El Burro opened in 2010 and immediately found an appreciative local audience. Four outlets, including a Mexican food truck and retail shop, later, Berolsky and his partners have opened a taqueria in an early 20th-century Victorian-style pile in Tamboerskloof, an artsy Cape Town neighbourhood. 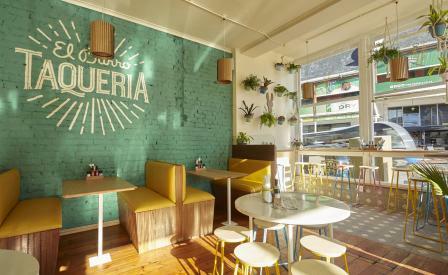 An exposed face-brick wall painted an eye-catching shade of turquoise blue, creamy walls and colourful stools set the mood for the imaginative tacos dreamed up by the four partners and head chef Paul Van’T Hoff, an alumnus of the original El Burro. The house special is, of course, tacos – the corn tortillas are made daily by hand – but the menu has been broadened to appeal to local tastes and, so, includes ceviche served with mini tostados, chicharrons, quesadillas, paletas and churros. Mountain views of Lions Head and Signal Hill are the perfect accompaniment to taco layered with cumin and paprika scented roast cauliflower, lime cream, red cabbage slaw and a singeing peanut and arbol chilli salsa.